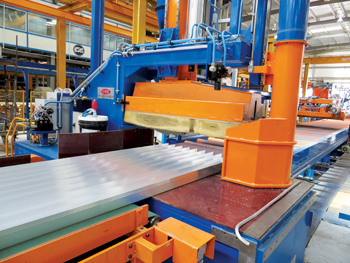 Aluminium Products Company (Alupco) has announced growth in both local and export sales in 2014 and said its expansion project for its Dammam plant is proceeding according to plan while its Jeddah plant has received a new anodising line. “Alupco is proud to have increased total export sales by 5 per cent during the year and local sales by an impressive 7 per cent despite the market being very tough in Q4 because of the economic situation globally and the drop in oil prices as well as some projects having slowed down,” said executive sales manager Mohammed Al Enezi. “Alupco continues to be the leader in the Middle East and North Africa region,” asserted Al Enezi. “Land for the Dammam expansion has been purchased and licences to operate have been obtained. We hope to have the plant up and running by the first quarter of 2016 or the middle of Q2 of the year,” said the official. 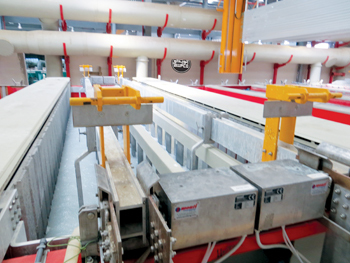 The company had announced earlier it is installing at its Dammam plant a new anodising line, a new casting house and a new press of 112,000 tonnes per year as well as two new thermal break production lines. Current annual production capacity there is around 40,000 tonnes with four extrusion presses, two aluminium cast furnaces, one anodising line, two vertical powder coating lines, two wood finish paint lines, one thermal break crimping line, two polishing machines, two protective tape machines and three automatic packing lines. “We might even slow down the plans just to ensure that everything installed is of the highest quality so that our customers may receive the highest value,” said Al Enezi. A contract has already been signed for a new and modern thermal break line, he said. 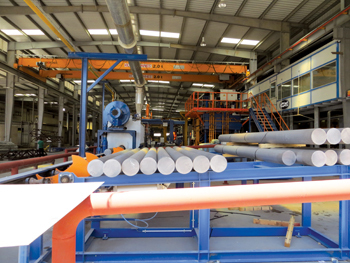 Capacity at the Jeddah plant was around 45,000 tonnes per year before the new anodising line was introduced. The plant has five extrusion presses, an aluminium cast furnace, two anodising lines including the latest addition, one horizontal and two vertical powder coating lines, two polishing machines and three automatic packing lines. “Due to our new press and anodising line in Jeddah, we were able increase our production volume by 10 per cent in 2014,” said Al Enezi. The company also revealed it is close to signing the aluminium composites panel (ACP) venture with Alubond USA and expects to operate the plant with its joint venture partners in the near future. Alubond USA is the largest producer of ACPs in the world, bringing out more than 12 million sq m per year. Alubond ACPs have applications in building facades, ceilings and interiors, solar mirrors, acoustic machine covers, bathrooms, yacht interiors, fire-rated doors, transport and carpark grills. Products that enjoyed strong growth last year were the curtain wall architectural system and items for industrial applications. “Alupco always receives new aluminium architectural systems from our exclusive partners of AluK. They are constantly innovating new systems and they provide us with all the newest innovations straight from Italy. Alupco has been very pleased with this partnership for many years and we continue to give our customers in Saudi the best products from Europe. We have also added a brand-new thermal break line as indicated to give our clients the newest technologies in thermal break,” said Al Enezi. Alupco is involved with prestigious projects at the moment including Hafer Al Batin University. The company is working on three other projects that also happen to be universities – Naeryah University, Khafji University and King Khalid University – plus Saudi railway stations that are being built in six cities. Additionally, Alupco is supporting the Hugayet Tower in Khobar by supplying them with aluminium of the highest quality. The company is also the primary supplier for the King Abdullah Project for Development of Security Compounds. Most of Alupco’s business, some 60 to 70 per cent, comes from Saudi Arabia itself. “Although we may be able to penetrate new markets globally, Alupco has the desire to support our local projects and to help Saudi Arabia with our expertise and superior aluminium solutions. We believe that the kingdom should have the most superior aluminium in its buildings and the highest of standards from Europe as well – with AluK. We believe that Saudi Arabia should have the option to choose what best fits its needs. Whether it be from Europe or locally, Alupco has the solution,” said Al Enezi.